Oh man am I excited about today's recipe, guys. Not only is this something I've been wanting to make for a very long time (seriously...how have I not made apple butter yet?!) but it uses some super amazing ingredients AND is cooked in a slow cooker! Score! I love things that are easy to prep, use high quality ingredients, go into the slow cooker and I barely need to attend to. Slow cookers are where it's at, friends. They do all the work for you and allow you to create some magical foods without all the fuss. My grandmother used to make apple butter all the time. She had the most delicious apple trees in her front yard and when they were filled to the brim with tart and sweet apples, she'd pick a bunch (trying to get to them before those pesky birds) and make a batch or two of apple butter. I remember loving that! So wish I had her recipe- it was amazing! It's about time I have a little recipe of my own! My husband and I love this stuff so much and usually just end up buying a few jars from Oak Glen or wherever else to enjoy during the fall. I wanted to make a recipe that first of all didn't include any sugar. Why? Because apples are naturally sweet and as they cook down, they sort of develop their apple-y sweet flavor a bit more. You really don't need any! Plus, as you know- we're all trying to avoid the stuff as much as possible. Not adding sweetener of any kind really allows the apple's natural sweetness to shine and creates a butter that's not too sickly sweet. Second, I wanted a recipe that was super simple in ingredients- again, really allowing the apple's greatness to be the star. I didn't want to add this and that and end up with more of an apple-y hodge podge than a natural, good ol fashioned apple butter. So I chose my ingredients wisely :) Cinnamon and cloves...with a dash of vanilla extract because, vanilla makes the world go round. Because we're using such few ingredients, we really want those to be the best we possibly can. Try and get the absolute best apples you can get your hands on- organic if possible. Look for ones that are sweet AND tart- this isn't the place for a Granny Smith. You'll need the slight sweetness because of the lack of added sugar and the tart to break through the slow cooking. I highly suggest using an apple like Pink Lady, Honeycrisp, or if you can find- Pippin! That's what we used and they were amazing! Get the best vanilla extract you possibly can and really add some sparkle to that butter. As for the cinnamon, one of my absolute FAVORITES is Flavor of the Earth's Pure Ceylon Cinnamon. It's so much different than the kind you find at your local grocery store. It's lighter in color, smells ridiculously good (think sweet, tart, and spicy! Almost cinnamon apple candle like! )...I mean, the smell gets me every ding dang time, and adds such a great cinnamon flavor. One like no other. It's GREAT in desserts with apples! Remember this one? The best part about Flavor of the Earth is that they bring in fresh Ceylon Cinnamon bark from Sri Lanka and immediately make their ground cinnamon in small batches. They freshly grind the bark into cinnamon powder and immediately pack it into flavor pouches to capture the full freshness and health benefits. What's more, their Ceylon Cinnamon is also a great source of Manganese, Fiber, Calcium and Iron. It’s also salt free and has never had any chemicals, pesticides, fertilizer, additives or preservatives used in growing or harvesting it. Awesome right? So it only made sense to add this to my simple slow cooked apple butter. If you've never tried this type of cinnamon, I strongly suggest picking up a batch and giving it a whirl. It'll blow your socks off. 1. Wash and dry apples. Core each one and cut into medium sized chunks BEFORE weighing. For 4 pounds of apples, this took about 18 medium sized Pippins. 2. Add chunks to a large bowl and mix in the delicious and fragrant ground cinnamon, cloves, salt and vanilla extract. We like things bold in flavor; if you aren't such a fan, you can reduce the cinnamon amount to 1 1/2 tablespoons. Totally up to you. Toss well to coat all the apple chunks. 3. Add apples to your slow cooker and add in the 1/4 cup of water. This will help break down the apples faster and keep anything from burning on the bottom during cooking. Put lid on and cook on high for a total of 5 hours. 4. At about 3 1/2-4 hours in, stir up apples making sure to get all the way to the bottom. Using a stick blender, puree mix until completely pureed and smooth. You could also use a blender or food processor for this, but I highly recommend investing in a stick blender. It allows you to puree hot things right in their pot, pan, or crockpot without having to remove anything (and potentially burn yourself)! If using a blender, add everything back to crockpot once thoroughly pureed. 5. Place lid back on crockpot, but slightly ajar so any moisture can escape during the remainder of the cooking time. Continue to cook on high stirring every 20-30 minutes to prevent burning on the sides or bottom of pot. 6. After 5 hours total, mixture should be a nice deep brown color, thick, smooth and filling up your house with the most amazing spice smell. It should also pass the plate test. 7. To finish, simply spoon butter into glass canning jars and seal with two-piece self sealing lids according to your canning instructions for long term room temperature storage. For refrigerator storage, spoon into glass canning jars, tighten with two-piece self sealing lids, and allow to sit on the counter until you hear the POP of the lid. Once that happens you can store in the fridge for weeks! This stuff makes the BEST homemade edible gift for friends and loved ones! The apples are perfect this time of year making the butter perfectly naturally sweetened. Everyone loves a gift they can eat without shame, right? Good for you, good tasting, made with love... perfection in a jar. So now for the fun part! Flavor of the Earth has generously offered to give one SLBS reader a full ONE POUND BAG of their fresh ground, preservative free Ceylon Cinnamon! ONE POUND FRIENDS! Do you know how much a pound of cinnamon is?! A whole lot. With Christmas coming up, imagine all the fun things you could make and bake for friends and family! Please enter truthfully as all entries will be verified! CONTEST OPEN TO US RESIDENTS ONLY. Contest will run for 7 days and will end on December 2nd. Winner will be shown on this blog post upon being chosen AND will be contacted by Sweet Lavender Bake Shoppe via email. Winner has 24 hours to email back and claim prize before a new winner will be chosen. Prize is graciously donated and shipped to winner by Flavor of the Earth. *Flavor of the Earth provided me with a free sample of this product to review. I was under no obligation to write a positive review. All recipe pictures, opinions, and the recipe itself are my own. i would use the cinnamon for waffles and cookies first! YUM! I love apple butter! wonderful recipe and giveaway! 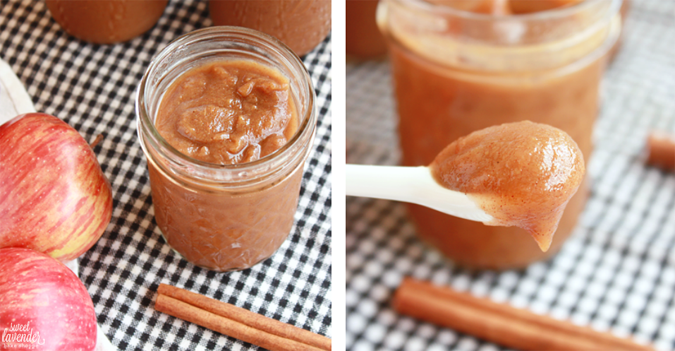 i would use the cinnamon for any recipe on my list of recipes to try that calls for cinnamon! So do i!!! Like A LOT! 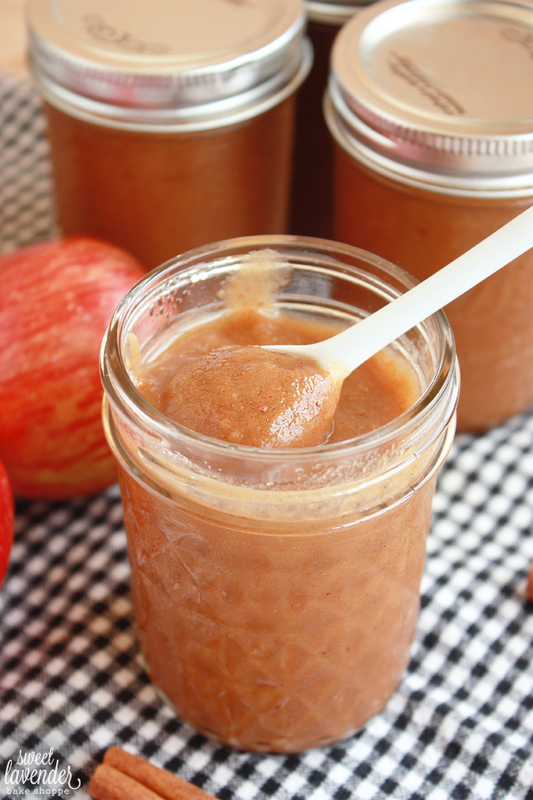 Homemade Apple sauce and Ill be trying this Apple butter recipe soon too! So hope you do and like! Mmmm, this looks delicious!! 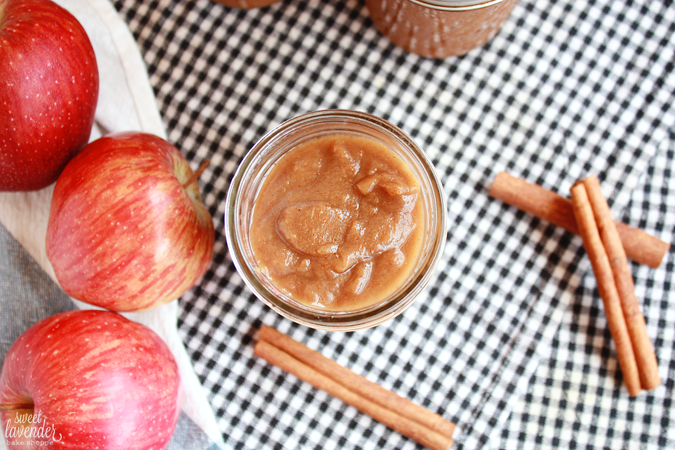 I would love to make a batch of this apple butter for Christmas presents. Thanks for the giveaway and the recipe! Mmmm, it look soo wonderful. I made some apple butter a while ago and posted about it too :) I've been trying to add more cinnamon in to my daily life because I've read it can help regulate blood sugar! I've always loved cinnamon ice cream, but haven't made it (despite having an ice cream maker). I'd definitely make some with this prize. It totally can! Love cinnamon because of it's flavor and it's health benefits! I have a sprinkling in my decaf coffee right now! Yum cinnamon ice cream!?? Sounds awesome! I made this and it does, in fact, smell amazing. However, I wasn't sure if the apples were to be peeled or not. Do they need to be peeled? Since I used the Back to Basics Apple Peeler, because I had quantities, I went ahead and peeled them. I also used cider in place of the water, since I had it on hand. Delicious! But I did want to know if you made yours with or without the skin. THANKS!